Screenshot / BBCGeorge Corones swam 50 metres in 56.12 seconds at an official event in Queensland, Australia. A 99-year-old swimmer has smashed a world record. George Corones returned to swimming at 80, purely for the “exercise,” but has now etched his name into the history books. An Australian swimmer has smashed a world record – at 99 years old. George Corones swam at an official 50-metre freestyle event in Queensland, and set a new standard for the 100-104 age range with a time of 56.12 seconds. Corones, 99, qualified as a centurion as he turns 100 in April. 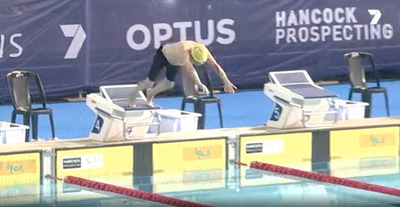 The Australian credits his successful performance to preparation, including swimming three times a week, and his technique during the race. Corones swam when he was young, but gave it up over 60 years ago. He returned to his hobby at 80 purely for the “exercise,” according to the BBC. Corones was the only competitor in the event, as the race was organised specifically for him to beat the record.